Quiet, peaceful, and secluded, yet only a 3 minute drive to Zoni Beach and a 10 minute drive to town; our fully-equipped 2 bedroom house is a wonderful retreat from the hustle of typical resort settings. See also Zoni Breezes Upper and Lower #288656 and #345119. Why share a house, or stay in an apartment when you can enjoy the privacy of a whole house (open floor plan/high ceilings) to yourselves! The house is surrounded by thousands of acres of virgin countryside and hiking trails, with an ocean view from the upper part of its one acre parcel. Nearby Zoni Beach is incredible and uncrowded. Many times during the week we are the only ones on a one mile long soft white sand beach with gentle trade winds swaying green coco palms, and crystal clear turquoise waters. The snorkeling and diving on Culebra is some of the best in the Caribbean. For debit card use on lodging a $50 fully refundable damage deposit is required, to be debited prior to occupancy. See 'further details' below for information regarding renting our 4 door, 4 wheel drive SUV. Sport Utility Vehicle Rental: You can rent our Mitsubishi Montero 4 door, 4 wheel drive for $55 per day for 5 people or less, and $65 per day for 6 people or more. $100 gas deposit is required on vehicle rental. A credit card (no debit cards), automobile liability insurance, and a driver's license are required for the vehicle rental. Our house and vehicle managers Ron & Debra will provide transportation to and from the ferry or airport when you rent the Montero for each day of your stay. My wife, son, and I live in Rogue Valley Oregon where I am involved in piano sales and service and also real estate construction. We love Culebra and visit there as often as we can, usually twice a year. After visiting Culebra on our wedding anniversary, we knew we wanted to return and live like locals. We found our place and remodeled to double the size of it. We use it as a second home and hope you enjoy it as much as we do! Free local. Long distance with calling card you should bring. In every room except bathroom which has a ceiling fan. Large concrete patio with barbeque, patio table and three benches, under a Sunsetter Awning. Secluded and well maintained property. Recommend it and would go back next time I travel to Culebra. Nice open floor plan. Plenty of space. Nice having washer & dryer. Amazing little private place! Clean and comfy! If you like it quiet and remote this is ideal. The caretaker is very accommodating. Far from town and poor wifi. That's why it's called a vacation. Our stay at owner Tom Lowell’s property entitled, “Culebra Island Secluded Vacation Rental House/One Acre Zoni” has been a generally good experience. The location was quiet. There were no barking dogs, no crowing chickens, no traffic. The steep, rough, dirt road leading from the paved road to the house is only two blocks long. This makes access better than for many other Culebra rental houses. But, we are glad that it did not rain. Half of the house is of concrete construction and the other half is of wood construction. The half constructed of wood is made of 2x4s and painted plywood with painted wood siding on the exterior. There is no interior wall surface here, simply exposed 2x4s. There are lots of windows all around. We found the beds to be clean and comfortable and the appliances to be in working condition. The refrigerator, clothes washer, and dryer are quite new. The water had good pressure and the shower was hot. Tom has a new toilet and vanity in the bathroom. The red sectional sofa shown in Tom’s photos is in terrible condition. The vinyl is not only worn but is completely gone in some spots. It needs to be replaced or the photo of the sectional when it was new should be updated. And while he is at it, Tom should replace the fabric lawn furniture outside on the patio. The furniture is badly torn and presents a bad impression as guests drive up to the house. The kitchen is as dated as the photo of the kitchen suggests. The counters are primitive, the cabinets worse. And we found the lower cabinets to be padlocked closed. But there was an assortment of pots and pans on an upper shelf available for our use. And we found salt, cooking oil, and filters for the coffee maker. There is also a toaster and microwave available. The kitchen table is a plastic folding table with the surface broken on one side. Prospective guests will be interested that I was asked to (and did) sign a contract before renting the house. The contract is pretty general except for part 6. on page 1. I quote, “...Renter agrees not to publish...any disparaging reviews of the premises on the internet...(or) it is agreed Renter has violated this contract and shall be liable for liquidated damages in the amount of $500.00 to be charged to Renter’s credit card...” I can only hope that this has not had any effect on previous reviews. Tom, I request that you eliminate this part of your contract in the future. This review is accurate. We are here now and have replaced both the interior couch, which peeled when guests sat on it with wet bathing suits. We also replaced the table and the outside cushions the reviewer referenced. I have no problem with honest reviews, the no disparament contract clause is intended to dissuade review extortionists which do exist. We have addressed the reviewer's concerns and always welcome feedback! Our family of five really enjoyed this house in Culebra. It is easy to get to from the airport and is very close to Zoni beach. There was plenty of sleeping space and we cooked our own food. The house had all the basics that we needed and was very peaceful at night - just what we were looking for. There were a few things that needed minor repairs, but overall it was well maintained. We rented the car that came with the house. It worked fine but was a bit worse for wear. Next time we will probably research renting from one of the other companies on the island. We spent our days at Zoni, Flamenco, and Casa Rosario beaches enjoying the sun, swimming, and snorkeling. It was our first visit to the island and the beaches are fantastic! We would highly recommend this property to anyone with a family looking for a quiet place to get away. 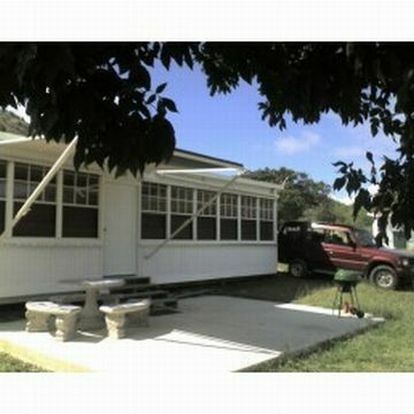 Exclusive Zoni Beach area of Culebra 10 minutes from Dewey ** Mountain View: Ocean views from top of one acre parcel. 200 foot hike up driveway to upper pad. Surrounded by thousands of acres of virgin countryside, great hiking on jeep trails** Secluded location, 900 square feet, open spacious floor plan, ceiling fans, great countryside views, trade winds, 20 opening windows, Sat TV, wireless internet, landline telephone, 3 minutes to Zoni Beach, one of the finest in the Caribbean.